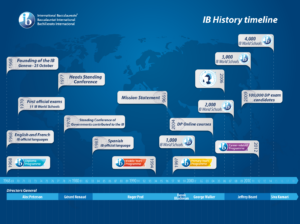 What are the benefits of an IB education compared to other schools? • Professional development that supports effective educators and collaborative professional learning communities. • A worldwide network of highly respected IB World Schools, working together to share best practice. IB students in the IB PYP and MYP performed better than non-IB students in a global International School´s Assessment study that ran from 2009 to 2011, while DP graduates complete college faster than their peers, feel more prepared for college-level coursework involving research, and are better able to cope with demanding workloads and time-management challenges. The IB also helps schools with programme planning and optimization. This may include mentoring, coaching, consultation or self-guided learning online. Further, an analysis of the DP suggested that the programme’s heavy reliance on discussions, debates, oral presentations, written assignments and teamwork enables students to develop many of the skills necessary for civic engagement.